Baby walkers, wheeled devices that allow a non-walking infant to scoot himself around the house by pushing off with his feet, are controversial devices. The American Academy of Pediatrics advocates banning baby walker, citing numerous injuries and the fact that they can delay normal infant physical milestones, like crawling and walking. Baby walkers remain very popular, however. The age at which an infant can use a baby walker varies, depending on the baby's size, strength and development. The purpose of the walker is to entertain a baby who can't yet walk and increase his mobility. Some parents also think that using a walker will help their baby walk earlier, although the opposite actually appears to be true, according to Jay L. Hoecker, M.D., writing for the Mayo Clinic. At the minimum, a baby must be able to hold his head up steadily and have his feet touch the floor to use a walker. Walkers are designed for use by infants between the ages of 4 and 16 months, according to Consumer Reports, and children who can already walk should not use them. The infant also has to figure out how to push with his feet to make the walker move. The walkers themselves have several risks, primarily that fingers and toes can get pinched in the metal hinges that allow the walker to collapse. Sitting up in the walker may also give the infant access to objects normally out of his reach. In addition, walkers can fall down stairs or into pools, or run into stoves and other dangerous areas. While these things can also happen to a crawling baby, the walker moves more quickly, as fast as 3 feet per second, the Women and Infants Hospital of Rhode Island states, leaving parents less time to react. In 2003, over 3,000 American children were injured while in baby walkers. A 1999 study by lead author A.C. Siegel of the Department of Psychology at Case Western Reserve University reported in the "Journal of Developmental and Behavioral Pediatrics" that babies who used walkers sat, crawled and walked later than those who didn't use them. Infants who used walkers also scored lower on Bayley scales of mental and motor development, a standardized assessment test for infants. Babies develop control over their bodies in a prescribed pattern. 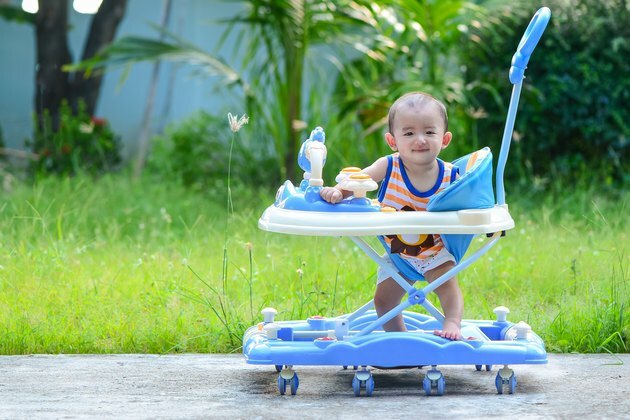 Using a walker allows babies who couldn't otherwise move to get around the house, bypassing all the normal developmental steps that usually lead up to movement. Because they can't see their feet in the walker, they don't get the normal visual feedback that accompanies motor skills, Siegel states, causing a type of early deprivation. While babies too young to move on their own can scoot around in a walker, early movement has no benefit and a number of negative developmental effects, in addition to increasing the potential for injury. MayoClinic.com: Baby Walkers: Are They Safe? How Many Pounds a Week Can I Lose Walking 50 Minutes a Day?